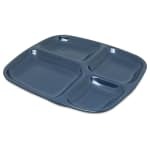 The Carlisle 4398635 tray is ideal for cafeterias and schools since it has four compartments for different food groups. In addition to being rectangular, the tray is also omni-directional. Its café blue melamine can match school colors and can endure heavy use without breaking. This tray can be stacked two different ways and is dishwasher safe. It should not be microwaved. "cooking for loggers in the woods"